Havana (and Cuba) saw its first automobile in 1898. That car was a Parisienne, shipped from Paris where its new owner had gone to escape the War of Independence. In the following year, another French automobile made its way to Havana, a Rochet-Schneider from Lyons. Cuba’s earliest romance with automobiles was hardly an instant embrace the American car; many of Cuba’s first imports from its northern neighbor (three of which belonged to the United States Minister) suffered mechanical failures. It’s my guess that attitudes toward American cars only changed after 1908, the year that Henry Ford began manufacturing that most reliable of workhorses, the Model T.
Wikipedia estimates the number of cars in Cuba today as 173,000. Another source, based on a 2008 World Bank estimate of the number of cars per 1,000 people in each country of the world, lists Cuba as 21 cars/1,000 people; this would result in some 239,517 cars. A third source, a 2014 article in Reuters claims there are “650,000 cars on the island,” which–unless I learn otherwise–seems the least reliable, and I will dismiss. Let’s agree to round off the number of cars in Cuba at 200,000. Of these, people in the know estimate that some 60,000 are classic American cars, mainly dating from the later 1940s up to 1960. After that year, the Cuban Revolution and the so-called American “blockade” banned importation of any American cars into Cuba, whether old or new. The following thirty-one photographs (with the exception of the last one) are of those classic, pre-1960 American cars, for which Cuba is rightly famous. Among these, you won’t see a Lada, a Moskvitch, a Geely, a GAZ, a VAZ, a Beijing, a Polski, a Peugeot 405 or even a Ford Falcon (made in Argentina). These exist as part of the remaining 140,000 cars. Almost all of them are state owned cars, among the many that Cuba had to import from other countries after that embargo that America imposed on Cuba in October of 1960. I took these first six photographs in a brief, two-minute walk around the parking lot in front of the José Martí International Airport before our group bus left for the drive into Havana. This was the only occasion in which my intention was to photograph old cars. All the subsequent shots were taken as I walked different parts of Havana to focus more on documenting street life, art and the urban infrastructure. The rest of the cars, seen below, simply found me. These five photographs were taken in the district of Havana known as Vedado. Development of the Vedado began slowly in 1859, then sped up at the turn of the century. In order to take advantage of the sea breezes, Vedado streets were oriented at forty-five degrees to those of the older sections of Havana to its east. Vedado’s streets were also wider, as were its planned building lots; promenades, trees, and parks were also stipulated in its original planning. The result is a district much better suited to the automobile, an object which would only arrive some forty years later. Also in Vedado, a major road, now called Linea because of the streetcar tracks that once defined it, is used as one of the fixed routes for the privately-owned older taxis, called ruteros. Starting from a few designated spots in Habana Viejo, such as El Capitolio Nacional, they ferry people (who hail them from anywhere along their route) to and from the city center. Their fee is fixed and they drop passengers at a spot on their route closest to the rider’s destination, but never at the front door. That service is reserved for the real taxis. Coger la Botella, my title for the first of these photos, is the Cuban phrase for hitchhiking (“to catch the bottle”). That green, 1953 Buick stopped to pick up a passenger, although I’m not sure if the passenger actually was hitchhiking or had been waiting on the Linea for a rutero). Because public transportation fell apart, especially in what Cubans call the Special Period, hitchhiking essentially became nationalized. How ironic to compare this with the United States, where, today, hitchhiking is outlawed in several states and stigmatized in most of the rest of our country. In Cuba, the gesture of the raised thumb, internationally understood as “thumbing a ride” or hitchhiking, had also served–in bars, before cars–as the request for another drink. Thus the term, coger la botella, or ir con la botella. The ruteros, most of which are pre-1960 automobiles, may well be individually owned. 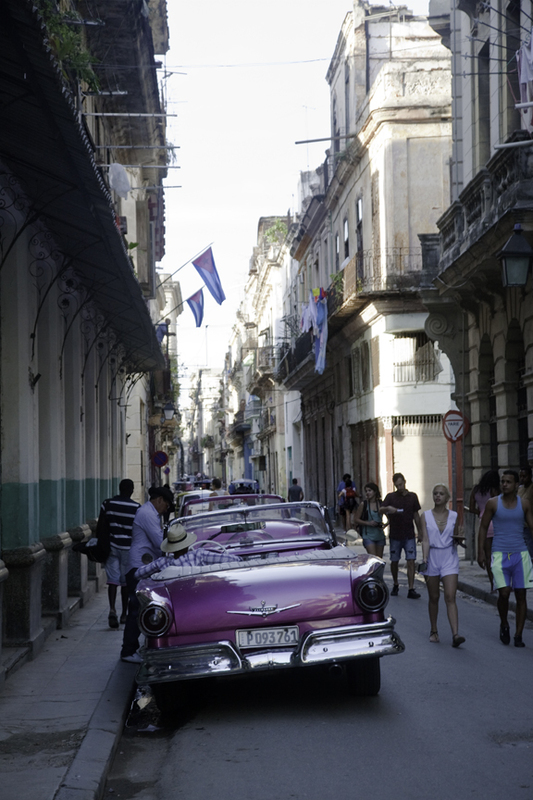 In contrast, all cars imported after the Revolution and the embargo that followed are owned by the Cuban government. Ruteros have long played an important role in supplementing an otherwise overburdened system of public transportation. Equally important, they offer their owners a means of earning a good bit more than the average monthly salary of 584 pesos ($24.30). On two separate evenings, we took an older taxi from our hotel in Vedado to a restaurant in the Miramar district. Unfortunately, I didn’t talk much with Rojas, our driver on the second evening, the dash of whose car is pictured above. On our first evening excursion, we were driven by Ramses in his 1957 Ford Fairline convertible. Ramses is a college graduate with a degree in economics. He told me that he couldn’t earn enough after graduation in the job given him by the Cuban government, so he took to driving a taxi. He rents his car from the government; he pays for its repairs and upkeep; and in order to save on gas, he removed its 272 cubic inch, 190 horse-power V8 engine and replaced it with a Russian four-cylinder engine and transmission. To offer some perspective on this situation (even if the comparison is an extreme form of “apples-to-oranges”), an American graduate with a BA in economics will enjoy a starting annual salary of somewhere between $35,000 and $44,000. It’s doubtful that, in this latter case, he/she would resort to driving a taxi. Sitting off the sidewalk in a residential neighborhood was this rusting shell from which everything useful has been removed: doors, windows, seats, steering wheel & column, axles, wheels, engine, transmission, drive shaft, rear end assembly. This is harsh, disrespectful language for a phenomenon that is, in fact, amazingly positive. 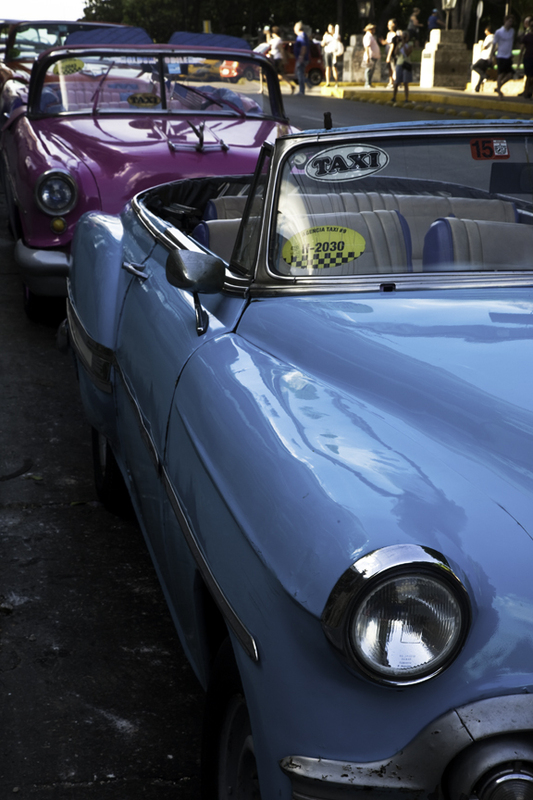 These cars should not exist today, not only because Cubans have had no access to replacement parts for sixty-six years, but also because of the corrosive nature of the salty sea air and the poor condition of the roads on which they drive–daily. Yet, here they are, all these gorgeous pre-1960 American automobiles; and they are working cars, not garaged classics waiting to emerge on an occasional sunny Sunday. It is crystal clear that Cubans “could…teach us a thing or two about recycling and refurbishment.” As the saying goes, Todo tiene arreglo excepto la muerte–everything can be fixed except death. I will read your latest Cuba I blog over the weekend… but for now you have some very nice photos of Vintage Automobiles from Cuba! The "hot pink and white interior" car is a classic. I remember all the US-made ones and associate them with people who owned and drove them. Comment #2 from me, Sy. What a wonderful write-up on the old cars in Cuba… a real education of the history of Cuban cars an not being able to import parts from the USA to fix American cars. So Tyko, what is your secret of being able to identify old cars by model and year? Great to associate the photos with the information. Thanks for sharing with us the photos and commentary!